Question: What's the outcome of your meeting? Governor Ortom: The meeting went on very well and I appreciate this. One, the party corrected me that they have no red card in APC National Secretariat, so they have not given me any red card. But I was given red card by Senator George Akume who is the acclaimed leader of the party in Benue State. I took it that it was serious enough to make myself available out of the pitch but the leadership of the party told me that the decision of the party leadership at the national level is superior to any individual or group of people so I think that is good. They have spoken to him. They have spoken to me. Stakeholders are going to be spoken to and that is where I belong. We have not concluded the matter. It is an ongoing process. I always stand for peace and I always want peace to prevail. I appreciate the intervention and I hope that we will be able to resolve the differences. Question: The rival PDP wants you back, what's your position as at today? 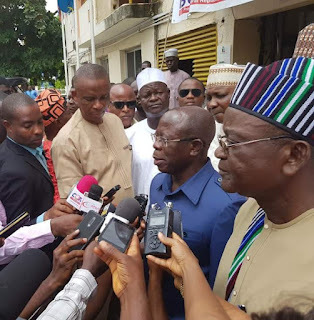 Governor Ortom: Well, I'm here in APC. I'm a member of the APC. I'm still flying the flag of APC and I only said that I was given red card but have been corrected by the National Secretariat. I think the Governor, His Excellency, has spoken very clearly and I think it should be clear to you. I've assured the Governor that APC does not have a red card in our cupboard so we can't give what we don't have. And we recognize that in several states there could be legitimate legal issues. There could be agreements, disagreements, some contestation and these we are familiar with. They are the evidence of the fact that we are a free democratic party and when leaders have disagreement our responsibility is to help them find a common ground. And the issues in Benue are not so fundamental that we cannot resolve. We are very confident that we will resolve them. Senator Akume is a very respected leader of the party, a former Governor, a current Senator, he will recognize the need for peace and we have what it takes to make peace. In Benue, we are going for a win win solution. Governor Ortom is not going any where. He is a very very prominent member of our party. We appreciate his leadership in Benue and we will do everything possible to help those who have issues to have those issues resolved. Anything we would do I would do. The only thing we would not accept is anybody leaving the house that we have toiled to build together. That we are committed to and I think the Governor's statement is clear. For PDP that is hovering round they must know that only people without honour will vomit in the morning and in the afternoon will convert it to launch. People like Ortom who have honour cannot leave PDP just three and a half years ago with his eyes opened and then two, three years later there are some tensions and he is thinking of returning to People Deceiving People. That cannot be an option. He is a man of honour, he knows that once you make one step forward the second step should consolidate the first step, that is the way to go. And be assured that PDP can go and do whatever they do, it would not change the minds of those who are convinced about building the future. It will not be without contestation. It will be based on the understanding that we can have contestation but we have the qualities required to resolve issues in a win win manner. And in Benue those will be deployed and I am sure Governor Ortom will be happy, Senator Akume will be happy and much more importantly, the great people of Benue State will be happy, not just our party members, because they want to consolidate what works, not to return back to a broken vehicle.